Much is understood about how people learn. Effective learning opportunities are designed with these understandings in mind. 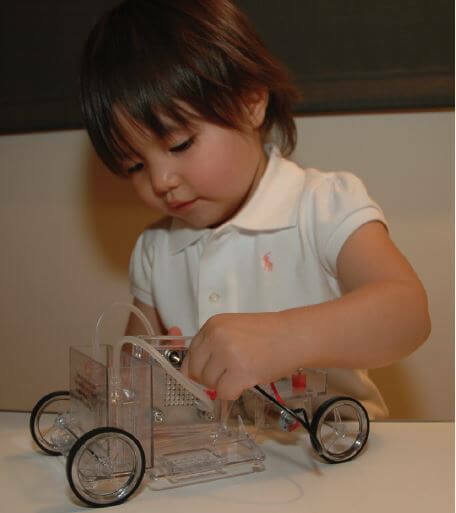 This young girl is assembling a fuel cell car that is used as part of a lesson on hydrogen and fuel cells. 1. People are born investigators and learners. People come to new learning experiences with preconceived notions and prior knowledge. They have developed their own ideas about how the physical, biological, and social worlds work. Effective learning opportunities acknowledge and access these preconceived ideas and prior knowledge, building on correct understandings and addressing those that are incorrect. 2. Effective learning focuses on a core set of ideas and practices. Focus on a core set of ideas and practices—rather than a broad array of what can become disconnected knowledge and isolated facts—allows a learner to make sense of new information and to tackle new problems effectively. This process is aided by explicit instructional support that stresses connections across different topics, disciplines, and learning experiences. 3. Understanding develops over time. To develop a thorough understanding of the world and how it works—and to appreciate interconnections—learners need sustained opportunities, over a period of years, to work with and develop underlying ideas. People can continue learning about core ideas their entire lives. Because learning progressions extend over many years, educators must consider how topics are presented at different levels as they build on prior understanding in support of increasingly sophisticated learning. 4. Literacy requires both knowledge and practice. The social and natural sciences are not just bodies of knowledge; they are also a set of practices used to establish, extend, and refine that knowledge. Effective teaching infuses these same practices into the learning experience, engaging learners in inquiry-based, authentic experiences that rely on credible information, data, and evidence as the foundation for taking a position, forming conclusions, or making claims. 5. Connection to interests and experiences enhances learning. Personal interest and experience is a critical part of an effective learning process. Learners must be helped to see how topics connect to their personal experiences and are relevant to them. This not only aids understanding in general, but helps to foster lifelong learning. 6. Educational opportunities must be equitable and accessible to all. Effective learning requires the right tools and opportunities, which must be suited to each individual’s needs.